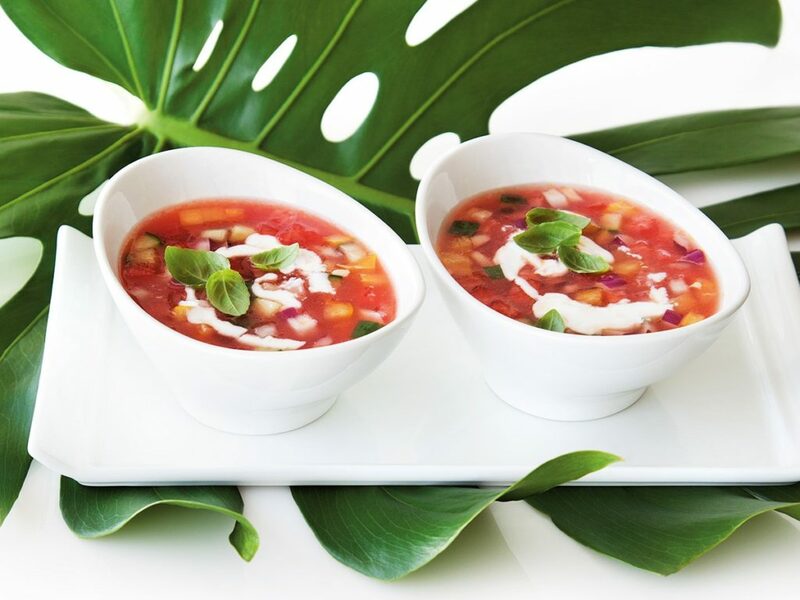 Watermelon gazpacho is perfect for Barbados when the temperature is hot, hot, hot! You can make this delicious cold soup using lots of lovely locally sourced vegetables. Head to the Holders Farmers Market on a Sunday morning and you’ll be able to pick up up lots of organic produce. This soup is nutritious and refreshing, a perfect light lunch or starter. You can tick the ‘5 a day’ box in one easy recipe. Even better, it requires zero cooking! That keeps you and the kitchen nice and cool. 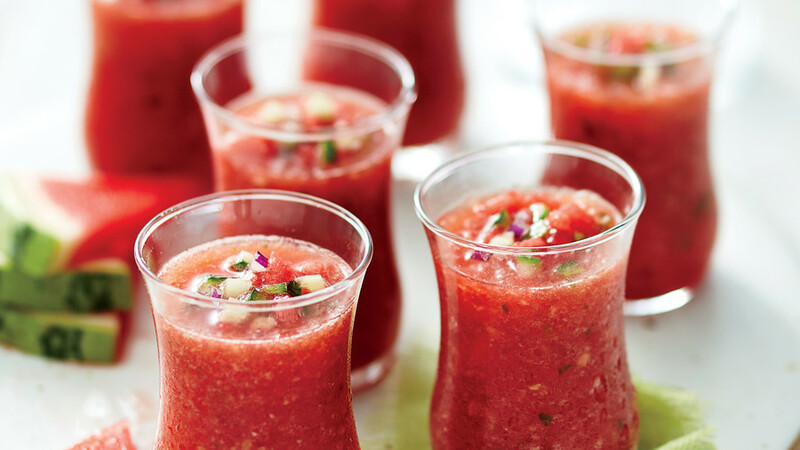 Every time I make watermelon gazpacho it’s always a winner, so give it a try. Make some extra because it will keep in the fridge in an airtight container for up to a week. Self-catering couldn’t be simpler! Puree 3 cups of the watermelon in a blender (leaving 1 cup in chunks) and pour into a large non-metallic bowl or jug. Add everything else to the bowl, including the 4th cup of watermelon, mix well and taste adding more sugar and/or salt if required. You can serve the soup in small glasses as a starter or in pretty tea cups. It can make a nice addition to a breakfast buffet, like an alternative Bloody Mary, and it’s not out of the question to add a splash of vodka if you’re feeling daring! 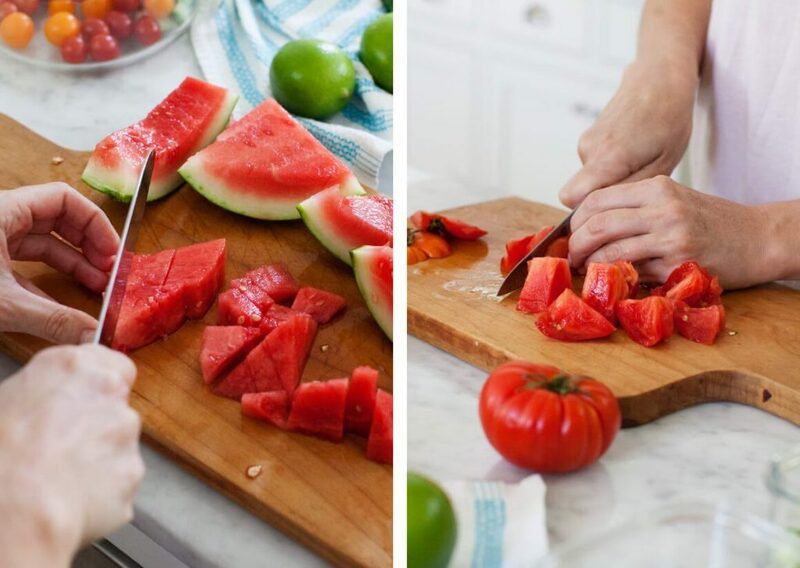 Use your imagination and top with a little sour cream, or decorate with slices of watermelon. If you want to make it into a more tropical event, try adding a small amount of finely diced pineapple. I like to chop the ingredients into quite small pieces, but you might prefer larger chunks – there are no rules. And if the thought of chopping all those yummy vegetables is just too much to contemplate – don’t forget we can recommenced a great private villa chef, who will come along and do all of that for you. That means you can get on with the important business of sunbathing, swimming and all the other things to do in Barbados. Watermelon gazpacho is always a crowd pleaser, it’s vegan, gluten free and has been known to win over ardent vegetable haters! It is gazpacho, but not as you know it, it’s an altogether more fruity affair!